The example photographs on this website were taken using the PROMINAR 500mm F5.6 FL. Reports on the PROMINAR 500mm F5.6 FL by professional photographer Koji Nakano. Mr. Nakano, who specializes in photographing wild birds and aircraft, exhaustively uses the Kowa Telephoto Lens/Scope. Here he introduces its user-friendliness and gives tips for using it to take better photographs. Vol.02 Digiscoping using the PROMINAR 500mm! 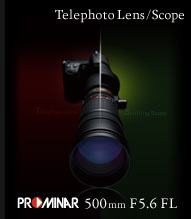 Vol.09 PROMINAR 500mm x Olympus OM-D EM-5 High Resolution Bird Photography made easier. Mr. Nakano was born in 1972 in Kanagawa Prefecture, Japan, and graduated from the Tokyo University of Agriculture. While studying at university, he released photographic works showing wild birds, wild animals, and landscapes in magazines and calendars. He particularly specializes in capturing “flying objects” such as wild birds and aircraft, and in recent years has frequently carried out assignments overseas. His works include the photograph collection “YATSUDA – Landscape and Wildlife in the Japanese Countryside” (Ie-No-Hikari Association) and the CD-ROM photograph collection “Living Landscape – Muku no Jokei (“Pure Scenes”) –”. Copyright 2011 Kowa Company, Ltd., all rights reserved.